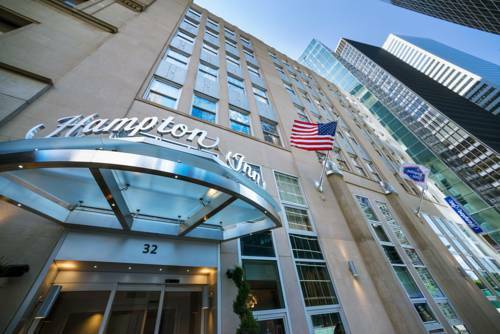 Embedded in the heart of Lower Manhattan the historic Hampton Inn Manhattan/Downtown-Financial District effortlessly marries historic charm with modern convenience. From its exterior walls garbed in limestone and original aluminum inlay to the chic interior lobby featuring complimentary Hampton On the House hot breakfast this hotel is tailor-made for the traveler expecting both style and quality. In town for business. We are only two blocks from Wall Street and are neighbors with some of the world*s largest business headquarters. Other neighborhood attractions include the historic South Street Seaport district and the World Trade Center Memorial site. Within steps from Battery Park you won*t find a better location if seeking to visit the Statue of Liberty and the Ellis Island Immigration Museum. Grab a cup of coffee and take in the cityscape as you ride the free Staten Island Ferry through the Upper Bay or walk the Brooklyn Bridge. With the R line less than a block away it couldn*t be easier to jump on the subway and step out into some of the city*s top attractions including Union Square Madison Square Park Times Square Central Park and Fifth Avenue shopping. Additional amenities include complimentary high-speed internet access throughout the hotel complimentary fitness and business center services as well as complimentary tea and coffee available 24 hours per day. Our passion for customized guest service topped with an enthusiastic desire to make you fall in love with our city will cause your stay at the Hampton Inn Manhattan/Downtown-Financial District to be truly unique. All reservations must be guaranteed with a major credit card or advance cash deposit to hotel regardless of time of arrival. All reservations must be cancelled prior to 48 hours host time unless deposit is required. Policy is subject to change.